3 Pcs. 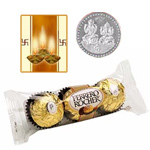 Ferrero Rocher Chocolates with free 5 gms Siver Plated Coin and Diwali Card. 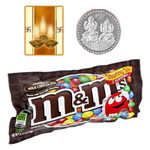 Famous M&M Chocolates ( 57 Gms.) Bag. 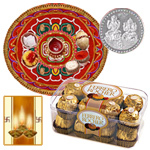 with free 5 gms Siver Plated Coin and Diwali Card. 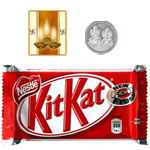 Kitkat Chocolate Bar ( 57 Gms.) 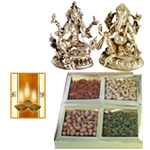 with free 5 gms Siver Plated Coin and Diwali Card. 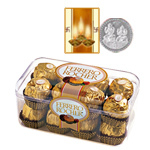 Ferrero Rocher Chocolate Box and Free Siver Plated Coin.Free Diwali Card. 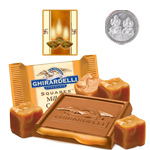 Famous Ghiradelli Chocolates ( 150 Gms. 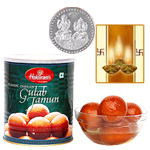 Pack) with free 5 gms Siver Plated Coin and Diwali Card. 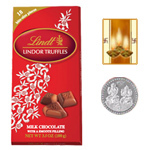 Swiss Lindt Lindor Chocolates ( 143 Gms. 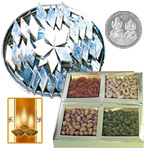 pack ) with free 5 gms Siver Plated Coin and Diwali Card. 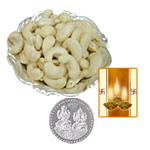 Diwali is one of the most popular festivals in India. 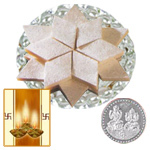 Diwali will be celebrated on 7th November, 2018. 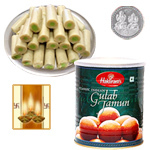 Pamper your loved ones by sending them Assorted Sweets, Crackers and Diya, Big Hamper of Kaju Katli, Dry Fruits, Crackers and Diya, Fresh Fruits n Flowers, Eggless Cake and Mixed Flowers Bouquet, Mixed Flowers Basket with Assorted Sweets, Ganesh Lakshmi with Dry Fruits, Ganesh Lakshmi with Imported Chocolates Hamper, Ganesh Lakshmi with Cadburys Celebration that show how much you care about them.